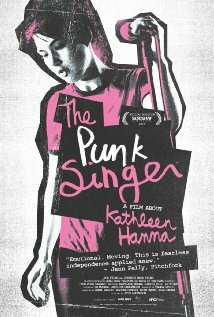 As I watched The Punk Singer, a documentary about Kathleen Hannah directed by Sini Anderson, I couldn’t help but think it an odd title. She is indeed a punk singer, having fronted Bikini Kill, Le Tigre, and her newest band The Julie Ruin. But she’s a lot more than that, as this film so deftly outlines. At the beginning we see her as a spoken word artist until she’s told that if she wants people to listen to her she should start a band. We also get glimpses of Hannah as an art student. When the school refused to show her work for being what they considered too controversial, she got together with some friends and put on their own show. This “controversial” art, as well as all of her work, centered around feminism and drawing attention to women’s issues. Bikini Kill paved the way for women in punk by letting girls know it was their scene too, and making sure the guys knew it as well. At their concerts, Hannah made male audience members move to the back so girls could have a safe space to enjoy the show without worrying about being shoved around or possibly groped. Her lyrics were never coy and often confrontational. Simultaneously, she was one of the creators of Riot Grrrl, a zine that explored feminist ideas through the lens of punk rock and formed a community for like-minded women. The film has a ton of great live footage, which in my opinion is the best way to experience this music. The performances are so raw and fierce and the many sides of Kathleen Hannah’s personality often come out over the course of a single song. However, about equal time is spent highlighting Hannah’s advocacy and activism. She believed in the feminist movement so much that she allowed herself to become its figurehead and accepted all the difficulties that went along with it, including harsh criticism from all sides and constant harassment. It almost becomes a film about the history of third-wave feminism, except the director never loses track of Hannah’s personal story. So we get the dissolution of Bikini Kill and the recording of her solo Julie Ruin album. We also get new insight into the illness that almost took her career away from her. For the first time, Hannah talks publicly about living with an illness while consistently being misdiagnosed. Though it caused a long hiatus in her musical career, the film climaxes with a concert held in her honor and the formation of her newest band, The Julie Ruin. As I watched the end credits, that’s when the title made sense. Kathleen Hannah isn’t the type to let a disease tell her what she can and can’t do. She is an artist and she’ll create art in spite of any obstacle. No one can say she’s just a girl. No one can say she’s just the mouthpiece for a group of uppity women. No one can say she’s anything. No matter what, Kathleen Hannah will define herself. The Punk Singer is now in select theaters nationwide.